UN special envoy for the Democratic Republic of Congo (DR Congo) Olusegun Obasanjo has sounded upbeat about his mediation in the conflict in the country, saying the Tutsi rebel leader accepts his role. At the end of his mission on Sunday in DR Congo's eastern province of North Kivu, the former Nigerian president said Laurent Nkunda, the Tutsi leader of the rebel National Congress for the Defense of the People (CNDP), accepted his role as the special envoy of the UN secretary general in mediating a deal to end the clash. 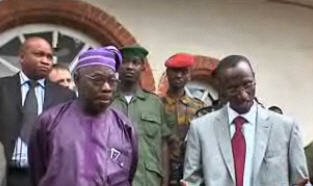 Obasanjo made the remarks after a meeting with the rebel leader in Jomba. He said Nkunda pledged to observe the cease-fire he had unilaterally called on Oct. 29, if not attacked, although he handed over a series of complaints about the government. The rebel leader also vowed to maintain humanitarian corridors for aid to refugees. When asked about the credibility of the promise by the rebel leader, Obasanjo stressed that the work is based on "the principle of reciprocal confidence." UN aid workers reported recently that they had began food delivery deep in the rebel-held area since fighting broke out in late October. The latest clash between the government forces and the CNDP has displaced 250,000 people in North Kivu, triggering humanitarian concern and relentless calls for the return to the Goma peace accord, which was signed by the two sides in January but collapsed in August. Obasanjo arrived in Kinshasa on Friday. Before flying to Goma, the special envoy met with President Joseph Kabila on Saturday.